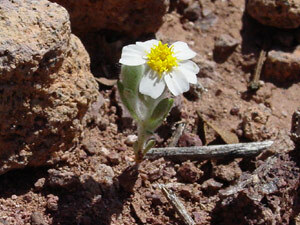 Description: The flower heads have yellow disks and 8 to 10 broad, white, notched or blunt-tipped rays. The leaves are grayish, linear, and they hug the upright stems. The plants are tiny and wrapped in fine, white wool. In years with sufficient winter rains, these tiny plants can carpet patches of the ground. 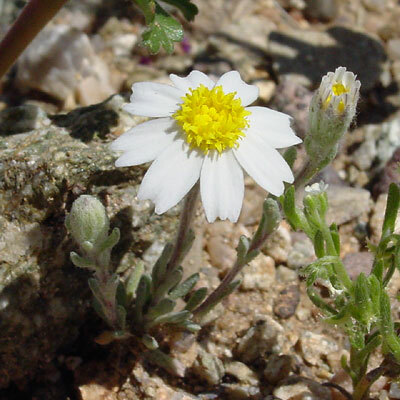 The similar Mojave Desertstar (Monoptilon bellioides) has flowers with more numerous, longer, thinner, round-tipped rays and a relatively smaller central disk.